Allow me to introduce Emily McSherry. Emily is the founder of Cannabis Forward which provides education pertaining to the science of cannabis to communities, legislators, and patients. As the FPAA Cannabis Legislation Reform Editor, from time to time Emily will contribute to the Face Facts blog and field your questions about cannabis for facial pain. At the time of this writing, twenty-nine states and the District of Columbia permit the use of medical cannabis, and nine states and D.C. permit the legal, recreational use of cannabis. This prompts the question: is cannabis going mainstream? [A Schedule I] drug has a high potential for abuse. The drug has no currently accepted medical use in treatment in the United States. There is a lack of accepted safety for use of the drug under medical supervision. Due to CSA restrictions and regulations pertaining to Schedule I drugs, obtaining a license to study the cannabis plant and its applications is virtually impossible. The resulting lack of research puts the United States decades behind Israel, Italy, and numerous other countries with respect to the study of cannabis. Due to the many obstacles to cannabis research in the United States, the National Institute of Health has been paying Raphael Mechoulam, an Israeli scientist, $100,000 per year for over 45 years to research marijuana. In the cannabis world, Mechoulam is known as the “Grandfather of Marijuana” because he and his staff were the first to isolate the very controversial molecular compound: delta-9 tetrahydrocannabinol, or more commonly, THC. Mechoulam is also responsible for the isolation and identification of cannabidiol (CBD) and of the first known endogenous cannabinoids: anandamide and 2-arachidonoyl glycerol. Thanks to his research and that of cannabis pioneers such as Dr. Ethan Russo, Dr. Prakash Nagarkatti, and Dr. Christina Sanchez, we are beginning to learn the truth about this simple plant. The first historical mention of cannabis was around 2900 BC by the Chinese Emperor, Fu Hsi and later in written Ayurvedic Medicine study around 1100 BC. Cannabis has been used for agricultural, religious, and medicinal purposes for centuries. In the United States, a variety of cannabis known as hemp has been grown and used for fiber, rope, soap, and food. In fact, from the Colonial years until the early 1900’s, hemp was one of the leading crops in America. Cannabis sativa was included in the United States’ pharmacopeia from 1854 until 1941, and by 1937, there were around twenty-eight over-the-counter medications that contained cannabis. As a result of their campaign, Anslinger and Hearst received support from Lammot du Pont of the DuPont Chemical Company and from several pharmaceutical corporations. It comes as no surprise that cannabis was a major competitor of DuPont’s companies as well as Hearst’s timber business. The American Medical Association (AMA) opposes the federal government’s position on cannabis as medicine. In 1970, at the same time that the Controlled Substances Act first made cannabis a Schedule I drug, the AMA testified against the Marijuana Tax Act and opposed the Schedule I classification. In 2009, the AMA voted to request Congress and the DEA to re-categorize cannabis as a Schedule II drug, but the effort failed. To this day, cannabis remains a Schedule I drug despite the fact that the United States government has publicly recognized the medicinal value of the plant. So certain are they of its medicinal value, they own a patent on cannabinoids used as an antioxidant and neuroprotectant. 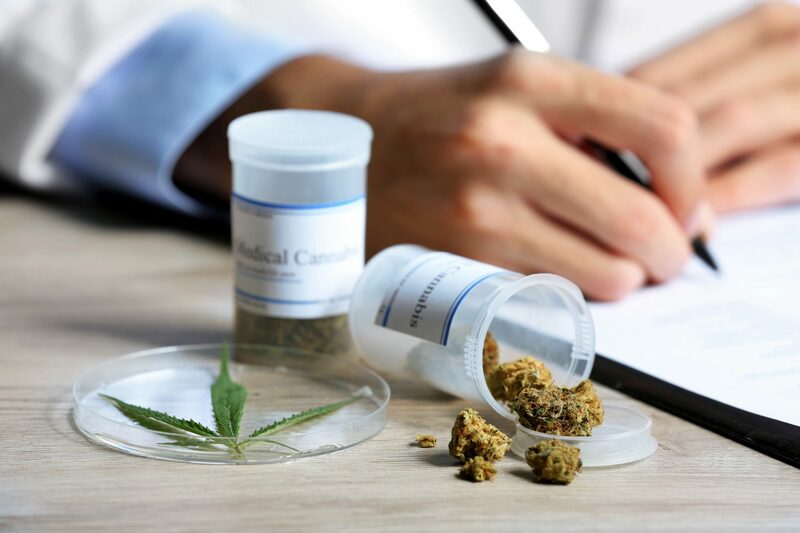 The two positions – that cannabis “has no currently accepted medical use” and that cannabis contains known antioxidants and neuroprotectants – are utterly incompatible, yet this logic-twisting position persists. Although cannabis and its derivatives are federally illegal, the FDA has approved several synthetic cannabinoids for medical use. Marinol (Dronabinol) was approved by the FDA in 1985 as a treatment for wasting syndrome in AIDS patients and chemotherapy-induced nausea and vomiting in cancer patients. The FDA has also approved a similar medicine consisting of synthetic THC called Nabilone. However, because these medications are synthetic and only comprised of the single man-made molecule THC, they fail to tap into the “entourage effect” which is what makes full-spectrum (utilizing all components of the plant) cannabinoid therapy so successful. In 2016, the FDA approved the synthetic cannabis medication Syndros which is a liquid formulation of Marinol. Syndros is manufactured by Insys Therapeutics, a company which also manufactures a fentanyl-based medication that is 50 times stronger than heroin. Insys Therapeutics is so confident that legal medicinal cannabis would have a deleterious effect on its bottom line, it spent nearly half a million dollars to successfully lobby against cannabis legislation in its home state of Arizona. While the federal government continues criminalizing the use, possession, and sale of marijuana, states have taken matters into their own hands. Oregon was the first state to decriminalize cannabis as early as 1973. California was the first state to legalize medical cannabis in 1996. Many other states followed suit over the next two decades. In 2012, Colorado and Washington became the first two states to legalize cannabis for recreational use. Now, two-thirds of the United States have implemented some sort of cannabis legalization, and 64% of Americans support the legalization cannabis. In recent years, Congress has passed legislation that protects state’s right in regards to their cannabis laws. The Farm Bill, the Cole Amendment, and the Rohrabacher-Farr Amendment have all provided states with cannabis legislation a safety net under which to operate within their state laws without fear of federal intervention. In January of 2018, just days after California dispensaries began selling cannabis for recreational use, Attorney General Jeff Sessions issued a memo to all states’ Attorneys General on Federal marijuana enforcement policies encouraging them to pursue prosecutions related to marijuana activities. While many Americans and cannabis patients feel threatened by this statement by Sessions, most Attorneys General in states with legal access vow to continue to support the will of the people. Cannabis is a controversial plant subject to a great deal of disagreement over its use. Political favoritism, perhaps driven and funded by pharmaceutical, petroleum, and other financially motivated interests, has kept this plant out of the hands of American citizens for almost a century, but change is happening. Where cannabis is legal, states are beginning to reap significant financial rewards and patients are benefitting from its many medicinal applications. It is only a matter of time before Prohibition gives way to the legalization of medicinal cannabis in all fifty states. The Facial Pain Advocacy Alliance stands in solid support of the responsible use of medical cannabis in the management of chronic pain. We firmly believe that cannabis has a place in the arsenal in the war on pain and that it has the potential to curb the use of opioids for chronic pain. Previous Post Call To Action: Take This New York Times Survey!